Q: WHEN WILL THIS FABULOUS GAME BE RELEASED?! A: 7 Billion Humans will be arriving on Win / Mac / Linux next week, Thursday August 23rd! We’re excited to share it with everyone! Q: I have never seen a trailer so beautiful. They should have sent a boat. I mean a poet. A: Yes, all the poets have been sent, and have been given useful jobs programming computers. Q: Where will I be able to get it? Can I see the store pages right now and click the wishlist buttons? Q: But what is 7 Billion Humans? 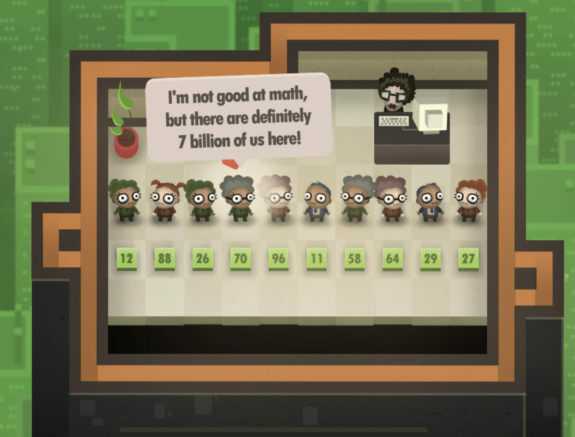 A: 7 Billion Humans is the thrilling followup to Human Resource Machine! You control many workers all at the same time, using a simple new language, with 78% more puzzles than the previous game, and 30% sassier boss dialog. And don’t worry, continuity people, the two games are fully standalone, and you can play them in any order. You’ll be taught everything you need to know. Q: But what about the Nintendo Switch version and other platforms? A: More info on the Nintendo Switch version and other platforms very very soon! In the meantime, here’s some gif evidence. Q: It turns out 96% of the world isn’t Americans! What languages can I play in? A: Yes, even though we’re all dumb American over here at Tomorrow Corporation, we’ve once again been working with our wonderful community translators to bring the game to: English, Spanish, French, Italian, German, Dutch, Russian, Traditional Chinese, Korean, Brazilian Portuguese, and Polish. More languages coming in future updates! Q: Can I play your previous game in Korean or Traditional Chinese? And also with a big discount? A: What a great question. As of today, Human Resource Machine has just been updated with Korean and Traditional Chinese support. And it’s on sale starting today through the weekend for 50% off on Steam, GOG, Humble Store, and our own site here. Q: How’d that beta go? A: This was the most useful beta we’ve ever done. With all the workers running around in each level, each puzzle can be approached in unexpected ways, and the beta players came up with insane solutions we never would have thought of ourselves. We also used the aggregate of their solutions to help set each level’s “OCD” scores (two extra optional challenges in each level). Q: But aren’t there more than 7 billion humans in the world now? A: We lost a few in a catastrophic rounding error. Q: Are there really 7 billion humans in this game? Thanks for your support, everyone! Make a strong cup of coffee, and we’ll see you looking sharp next Thursday! This is too much for me to take in! Last day! Concerning music, everything I use is not mine, and the original creators are in the descriptions of my videos. What ever happened to the real Alice, Betty, and Carol? that’s a LOT sooner than i expected! can’t wait to get a copy. I love those continuous AI references! Also, will we be able to help translate the game, as we did with Human Resource Machine? Yes! Now work on World of Goo 2 can finally begin!